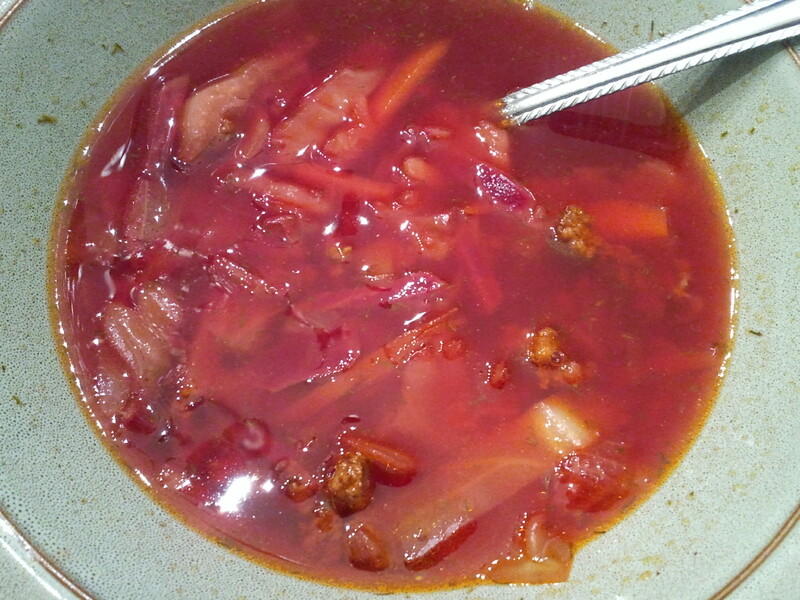 I had heard of borscht, but never actually had it. Beets are regularly available in Sunizona Family Farms FarmBoxes, so when my husband requested that I make this, I knew where I could get beets. I also had gotten a head of cabbage and a bunch of carrots from them, then I had onion and potatoes from Bountiful Baskets and ground beef from Zaycon Foods. Who needs the grocery store anymore?!? In my search for the recipe, I discovered that everyone makes this a little different. Even I varied some from the recipes I mainly used. I only had ground beef on hand, so I used it instead of stew meat. I also didn’t have tomato paste, so I used ketchup instead of the tomato paste and cider vinegar. This does take a little time and effort, but it’s worth it! It does have a little beet taste, but not really. It’s more of a stew taste with all the different veggies in it. And, fair warning, this makes a LOT, so be prepared to eat it for a few days or cut the recipe down. In a large soup pot, add the water and potatoes, bring to a boil and cook until potatoes are softened, about 15-20 minutes. Add cabbage and cook another 5-10 minutes. While the potatoes and cabbage are cooking, brown the ground beef over medium-high heat in a large skillet. Add carrots, beets, and onion, and cook until the vegetables have softened, about 15-20 minutes. Stir in the ketchup (or tomato paste and vinegar). Add the vegetable mixture to the soup pot. Add bouillon cubes, lemon juice, bay leaves, dill, salt, and pepper. Cook for about 5 minutes at high heat to dissolve the bouillon, then reduce heat to a simmer for 5-10 minutes, or until all vegetables are tender to eating. Serve hot, with a dollop of sour cream, if desired. Beets are not my favorite thing but like this, it looks pretty good!